A backstreet bakery-café in Hackney. You might say that Violet is a backstreet Dalston establishment famous for making cakes. Now it’s had royal approval. In 2018, Californian owner Claire Ptak was asked to make the cake for Prince Harry’s wedding to Meghan Markle. But guess what: it also serves delicious brunches and a heap of other non-cakey delights. Halva tahini brownies were the star. Moist, rich and chocolatey, they had swirls of sesame tahini with a distinctly nutty flavour, but the cinnamon buns were also excellent. Dense and bready, their nicely savoury flavour was offset by a dusting of sugar. In the absence of the famous cakes (which are only available in the afternoon), I tried all the mini cupcakes. They all had the same dense vanilla sponge base, but were made unique by their seasonal icing. The nicely sharp lemon was by far the best, followed closely by the delicate strawberry, then vanilla (with tiny specks showing they’d used bean, not essence). Only the mango – which was sweet but bland – disappointed. The brunch menu (muesli, toasties, salads) is made thanks to a variety of local suppliers, and the ingredients in my salty ham and buffalo mozzarella toastie shone: especially the very fresh sourdough from E5 Bakehouse and creamy cheese from Neal’s Yard Dairy. The Picklery (from Dalston Lane’s Little Duck) had made the kimchi on my blue cheese toastie, which was punchy but great, so I appreciated that you could get it (along with all the other toasties) in a half portion. Upstairs, this tiny bakery is set up like a 1960s living room – with yellow curtains, a few mid-century tables and an array of the finest indie magazines you could hope for. It was all very cute. I will be back, for brunch, yes, but especially for that brownie. Brunch for two with coffee and cake: around £35. ​Claire Ptak aka California patisserie chef aka royal wedding cake maestro aka Chez Panisse alumni aka owner of Violet Bakery is the founder of a charming little Hackney oasis that's been sitting on my must-eat list for some time now. As a massive fan of all things home baked, I've discovered that hers are the loveliest cakes, made with a quiet passion and a not inconsiderable amount of talent by her own flour dusted hands and those of her team. Violet is a tiny bakery with a few seats out the front for summers-day early birds or hardy December souls and a few tables upstairs where lucky locals and determined tourists sit and enjoy the quaint &understated but very comfortable atmosphere. It's not uncommon to see Ptak there so if your aim is to secure a signed cookbook, you might just be lucky. Staff are relaxed but always knowledgeable, polite and very accommodating. China is always pretty, mismatched and very covetable. Baked goods are always beautiful, minimal and very delicious. Homemade granola is dark toffee in colour and full of nutty, crunchy texture; served with silky rich yoghurt & seasonal fruit, it puts paid to any notion that ordering something you could technically have yourself at home is a waste of a breakfast out. Halva brownies boast the perfect ratio of thick fudgy chocolate to salty sesame ribbons and a baby bundt cake is draped elegantly with glossy dark icing and three tiny gold pearls; both are worth taking home to enjoy later with a tall glass of ice cold milk because while you're there, the thing you must order without fail or hesitation is the banana bread. Quite simply, it's the best in London. Squidgy & just the right amount of satisfyingly solid but still enviably light & sweet and in possession of a crunchy, crumbly topping, in a world of sad banana breads who never quite achieve their home-made, unputdownable destiny, this is flawless. This is not the sort of bakery that will give larger chains sleepless nights but it doesn't try to be; if it seems like exactly the sort of place someone who always dreamed of owning their own bakery might own, slightly inspired by their formidable chef background and seemingly by the style of their grandma, that's because I reckon that's exactly what it is and it's absolutely gorgeous for it. I was looking for a local bakery that could bake birthday cake for my boyfriend and found Violet on Instagram. In my defence, that was before I read Violet is actually baking cake for Royal Wedding. Cake was of course- delicious, they were even kind enough to drop it at the restaurant where we had our dinner that day, so it could be a surprise for my other half. They are the best! Visiting London and a day of shopping into Hackney. We were determined to visit Violet's and were pleasantly surprised. I wish we had the pleasure of a place as quaint and as intimate as Violet's. We not only enjoyed a quiche lunch and salad with the daily soda special and a cup of espresso but, the atmosphere as charming and personal. Purchased several cupcake treats for our return stay into London and a signed cookbook for our return home to California. Our experience today was as Royal as we expected. I love to go to Violet during summer and sip my coffee with a small cupcakes on one of the small tables outside. I'm lucky enough to live close to this place so I go when is not crowded. Today I went to Violet and bought some cupcakes and a cinnamon bun. The cinnamon bun was truly amazing, the best I have ever tried. Not cheap but worth the treat. However the cupcakes were disappointing, the sponge was dry (one of them crumbled after pealing the paper), the vanilla icing was nice but the red velvet icing was not as good. I still enjoy the place, and the cinnamon bun, but the cupcakes not so much. I am just shocked that anyone has anything bad to say about Violet beyond the fact that the small space at the front gets really crowded when you have to wait for your coffee. The staff are friendly (much better than at Wiltons), the coffee is great, the cakes are amazing (I don't even bother with the cupcakes personally as I've always found them too sweet, but the other cakes, cookies, scones, brownies, blondies, bread and butter pudding etc are fantastic! ), sure it's not the cheapest but I think you get what you pay for - the sandwiches are delicious, the atmosphere is really nice and if you want something cheap and nasty you can always go to Percy Ingle on Broadway Market or indeed Greggs on the Narrow Way. For me Violet is a treat that I'm happy to pay for and I hope it stays there for a long time! I just don't get it. I will say that the bakery itself is BEAUTIFUL and the cupcakes at least look pretty but the cakes taste of nothing. The sponge is always dry and though they claim to use all sorts of natural flavorings in the icing, they all pretty much taste the same - sickly sweet. I guess I'm not a cupcake person so not the best person to be reviewing Violet but the larger cakes also lack flavour and imagination. I love Violet Cakes - yes - the cakes aren't perfect, I agree that the sponge is sometimes a little dry compared to shop bought cakes, but this is becase these are home made. Proper home made cakes don't have a perfectly smooth moist texture. I also really love the flavourings used - the strawberry cupcakes are gorgeous and the icing is richly infused with a gorgeous English strawberry flavouring. I also love the passionfruit cakes. The cafe itself is adorable, small, intimate and with a lovely little outdoor area where you can enjoy your tea and cake and read the newspaper at leisure. So, sorry previous reviewer, but I wholeheartedly disagree with your review. I like the personal, initmate, home madeness of the food and the place and have always found it a delight. Plus it is local - lucky, lucky me. Violet is a wonderful experience... their salted caramel cup cake (not to mention full size cake) is just about the most delicious thing I've eaten! I only wish they were available at Maltby Street on a Saturday morning. 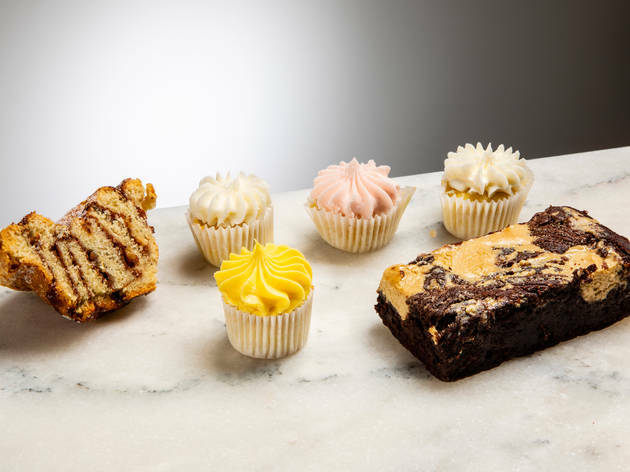 Red Velvet, chocolate with marshmallow frosting, ginger molasses cake & the sea salt chocolate chop cookies... I could go on. Everything is delicious. The cafe is also the sweetest spot in Hackney! 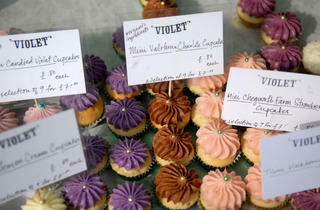 I live in Dublin, and when I visited London last October, I made a special trip out to Wilton Way to Violet Cakes. I can't remember where I first read about Claire and her delicious, delicate cupcakes, but I was determined to find the bakery and try some. It was a delightful afternoon, and my only regret is that I couldn't bring any home in my suitcase. 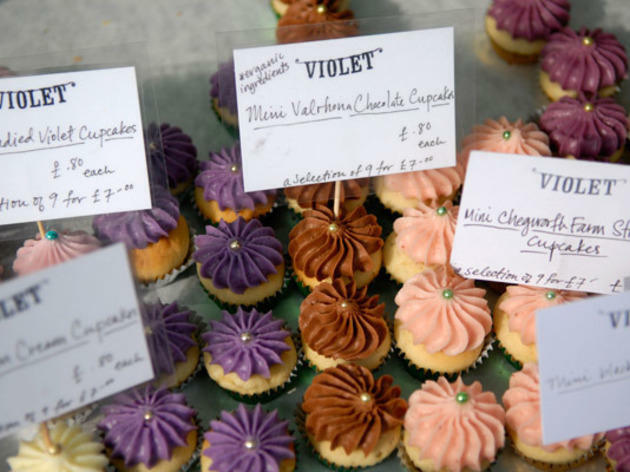 Wliton Way may be well out of your way, but Violet Cakes is worth the trip! I can't believe the comment below... seriously, I take everyone who visits London to Violet and ALL of them go crazy for the place, and more importantly, the cakes. Best in London. Without a shadow of a doubt. Violet Cakes is off the beaten track but well worth visiting. Aside from the brilliant cakes and coffee the atmosphere is really great. Sounds to me like EMS is out to promote this Lorraine Pascale's Ella's Bakehouse more than anything else... as it happens, I am a bit of a cupcake expert, and while I have not tried Ella's Bakehouse, I certainly have tried Violet Cakes' cupcakes and I can assure you the sponge is far from being dry and tasteless, and the icing everything but synthetic. Quite the opposite, in fact. I'm lucky enough to live around the corner from Violet. Truly one of my favourite places in London, with welcoming staff and a lovely relaxed vibe. The flourless chocolate cake is my favourite but you should take the time to try a little of everything. A weekend staple. Visited the stall in Broadway Market on Saturday after reading some good things about the cakes and was excited to try them. Tried the large size bergamot and passionfruit cakes, and mini rhubarb and sea salt caramel cakes. I had asked for a violet one as well, but when I got home and opened the box saw that the stall assistant had given me 2 rhubarb instead of a violet. The stall was prettily presented enough but if you look at the sponge, your instinct will tell you they are not good. And they were not: the sponge was dry and tasteless and a sickly pale yellow. The icing flavours - with exception of the passionfruit - tasted synthetic and there was no depth of flavour at all. An extremely disappointing experience, and an expensive one at that (£8 for 2 large and 2 mini cakes). 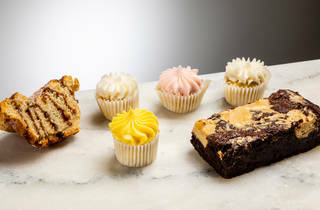 I will not be recommending these to anyone, spend your money at Lorraine Pascale's Ella's Bakehouse whose cakes are very good indeed and you get what you pay for.